Dr Yong Zhang, lead author of the research, said: "We used a novel version of the CRISPR system called CRISPR/Cas9n to successfully insert a tuberculosis resistance gene, called NRAMP1, into the cow genome. We were then able to successfully develop live cows carrying increased resistance to tuberculosis. Importantly, our method produced no off target effects on the cow genetics meaning that the CRISPR technology we employed may be better suited to producing transgenic livestock with purposefully manipulated genetics." Dr Zhang explained: "When you want to insert a new gene into a mammalian genome, the difficulty can be finding the best place in the genome to insert the gene. You have to hunt through the genome, looking for a region that you think will have the least impact on other genes that are in close proximity. We employed a meticulous and methodological approach to identify the best suited region for gene insertion, which we show has no detectable off target effects on the bovine genome". The researchers inserted the NRAMP1 gene into the genome of bovine foetal fibroblasts—a cell derived from female dairy cows—using the CRISPR/Cas9n technology. These cells were then used as donor cells in a process called somatic cell nuclear transfer, where the nucleus of a donor cell carrying the new gene is inserted into an egg cell, known as an ovum, from a female cow. Ova were nurtured in the lab into embryos before being transferred into mother cows for a normal pregnancy cycle. The experiments were also conducted using the standard CRISPR/Cas9 technology as a comparison. total of 11 calves with new genes inserted using CRISPR were able to be assessed for resistance to tuberculosis and any off target genetic effects. Genetic analysis of the calves revealed that NRAMP1 had successfully integrated into the genetic code at the targeted region in all of the calves. None of the calves that had the gene inserted using the new CRISPR/Cas9n technology had any detectable off target effects whereas all of the calves with the gene inserted with previously used techniques for CRISPR/Cas9 did. Dr Zhang said: "Our study is the first demonstrating that the CRISP/Cas9n system can be used to create transgenic livestock with no detectable off target effects. 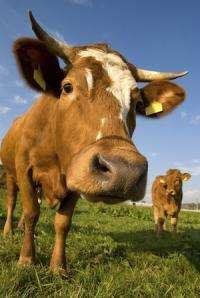 Our work has led to the discovery of a useful position in the bovine genome that can be targeted with this gene editing technology to successfully insert new genes that benefit agricultural livestock." Can they use Crispr9 to make a blight resistant version of the American Chestnut tree? ...and then just reprogram all of the biting insects so they can't carry disease anymore. Little problems like mosquitoes that can carry malaria or zika or ticks that carry lymes disease, etc.. There are so many types of mosquitoes that can't carry these diseases, we just need to copy those traits to the mosquitoes that can, or I am ok with taking the gamble of just wiping them off the face of the planet (since you can keep a copy of them and bring them back again if you miss them).